As mobile devices continue to evolve into smarter and more functional devices, so has trading evolved alongside them. In a fast paced and an interconnected world, trading on the go has never been easier. You are no longer bound to your dusty old desktop or a laptop to trade. Trading nowadays can be done from a browser based interface which is an operating system independent to your hand held smart phone or tablet device. Trading with the MT4 mobile platform makes it easy for traders to trade on the go thanks to the dedicated mobile apps that offer a great level of functionality. With Android and Apple’s iOS being the leaders in the mobile OS arena, it is not surprising that MetaTrader4 trading app can be installed on most any smart phone or tablet device. Available free of cost, these mobile trading apps can be installed quickly – allowing you to login to your trading account and start trading on the go. Of course, you will need to be connected to a wifi network or have a good mobile data package in order to trade on your mobile device without any interruptions. The screenshot shows the various navigation options that are commonly used on the MT4 mobile trading platform. Quotes: This tab is used to display price quotes and investment instruments. You can modify the instruments here to display your most commonly traded assets. Chart: This tab is used to display the charts on your MT4 mobile screen. Trade Details: The third tab is used to display your trading details such as equity, current open positions, floating profit and loss, and pending orders. From this window you can also change the trades, delete or place pending orders. Trade History: The fourth tab displays your trading history. You can sort your history based on the time period of your choice, including daily, weekly monthly or a custom time period. News: The fifth tab is used to display the news in the mobile MT4 platform. Indicators: The function tab allows you to add any indicator to your chart. 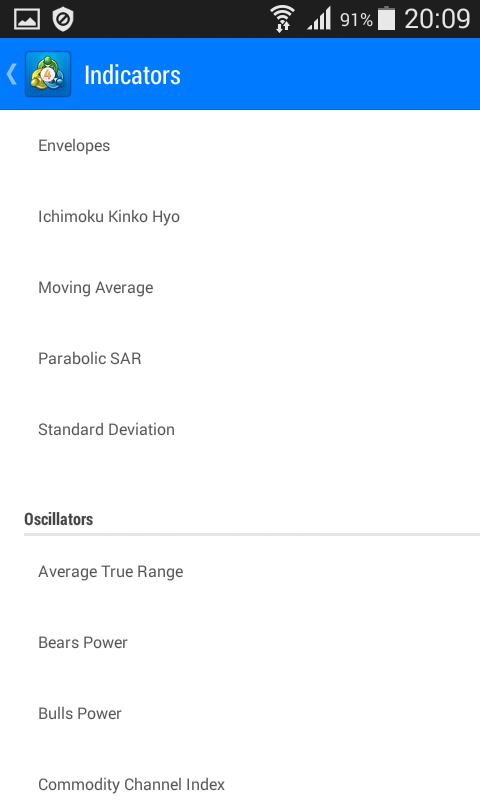 You can choose from the default set of indicators from the MT4 mobile trading app such as moving averages, Bollinger bands and any oscillators as well. Quick Navigation: The quick navigation tab on your screen can be used to switch between different trading instruments. Note that you can see only the instruments that you have added, outlined in the quotes tab (1). Time Frame: Using the time frame tab, you can quickly navigate between any of the standard time frames that are available (from M1 – Monthly). Settings: The setting icon will show you more customizations including changing the chart types, choosing between line, candlestick or bar charts and so on. Main Window: The main window displays the tab that you are on currently. While the above screenshot shows the chart tab, switching to the History tab will reveal the screen showing you your trade history. Trading on the mobile MT4 platform is relatively easy and can be done in different ways. The first approach is to go to the ‘Quotes’ tab and click on the instrument that you want to trade. You will then see different options. Select ‘New Order’ which will take you to the order management screen. Here you can select between instant or pending execution, select the lot size and set your take profit and stop loss levels. Another way is to click on the top right ‘Order’ icon to open up the order management screen. Switching between Line, Bar or Candlestick charts. Changing colors of the chart (select from a default color setting or create your own colors). Further customization includes showing volumes on the screen, trade levels, or period separators. The charts customization function can be accessed by the click on the ‘Settings’ tab. To check your account history, click on the ‘History’ icon from the bottom menu. 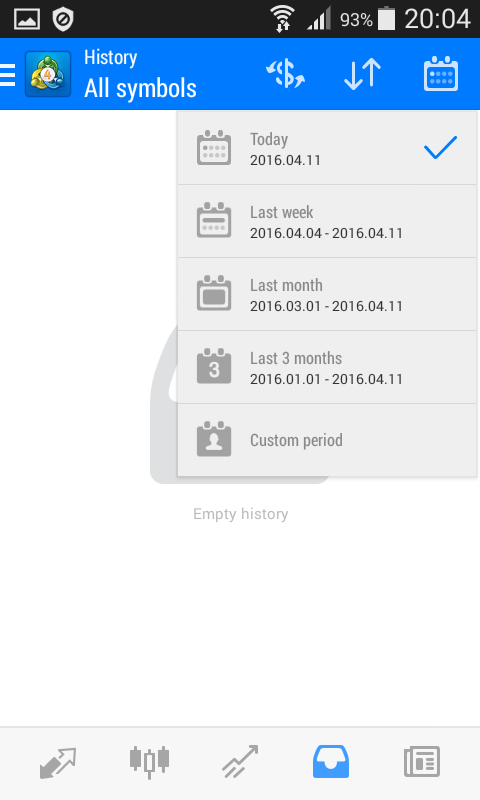 Here you can tap on the calendar icon on the top right to select the periods for which you want to see your history. The results can be further sorted based on the order number, symbol, open and closing time or profit. You can filter the trades in your account history based on a specific ticker symbol. To add indicators, you need to go to the ‘Charts’ screen. From the top menu select the ‘f’ icon where you can choose from a wide range of default trading indicators to be used on the charts. Note that while you cannot use any custom indicators, you will be able to change the settings of the indicators. The MT4 mobile trading platform offers traders a very simple yet powerful way to always be on top of the markets. From reading breaking news on the MT4 news tab to trading your strategies directly from your mobile trading platform, the MT4 mobile trading app is a great way to trade without having to stay in front of your terminal all day.